Summer camp will never be the same again when you sign your kids up for our Adventure Day Camps at Tree to Tree Adventure Park. We offer one extraordinary day camp annually, and each of our three-day summer sessions is jam-packed with excitement among the trees. Open to children ages 10 to 14, our campers blaze new trails, learn new skills, explore nature and challenge their inner selves through a series of fun yet educational activities. 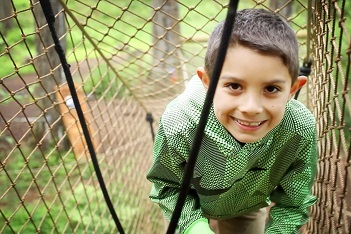 One of the most popular day camp activities is our challenging aerial adventure course. We have six courses total that offer a thrilling experience set high in the trees. Each course includes a sequence of obstacles that get more challenging as you move through the course levels and include zip lines as you traverse to higher levels. Children over the age of 10 have access to all six courses, which means all our campers have the opportunity to complete every course as they build their confidence level. Everyone starts on the easier, more stable courses that aren’t very high off the ground until they're comfortable enough to step up to the next challenge. 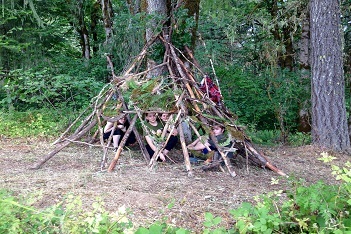 We only host one day camp season per year, so space is limited. Book your child’s summer adventure online to ensure they get the next available spot. Children should bring their own bag lunch, but snacks and water are included. Please drop off campers at 9 AM and pickup them up at 4 PM daily. Email Woody or contact us at (503) 357-0109 with questions. Tree-o-Caching, Trail Blazing & Understanding Nature! On the Aerial Adventure Course! Build Communication with Interpersonal Skills & Learn to Communicate without using your iPad! Core Values through Team Building, Inter-Dependence & Creativity! Space is limited, so book online today! 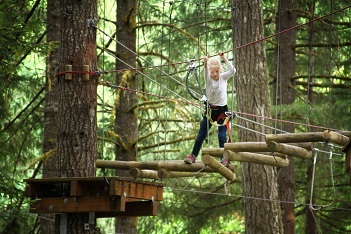 Email woody@treetotreeadventurepark.com or call (503) 357-0109 with any questions.